Small businesses struggle to look like the big guys. The truth is, though, small businesses are...well, small. For example, maybe you have three Zoho Mail accounts, five phones and several computers or tablets to keep up with. Who can stay ahead of it all? Fortunately, Zoho Mail makes it easy to consolidate: you can forward all mail received at one Zoho Mail account to another, to a notification app for your phone, and to any old email address, of course. Forwarding a Zoho Mail account means all the mail you receive at that account's address is automatically sent on to the email address you select to receive forwarded mail. You can have Zoho Mail retain copies of messages that are forwarded (say, as a backup) or elect to delete them. In the account that receives the forwarded messages, treat those messages like other mail. You can set up a filter perhaps that labels mail forwarded from the Zoho Mail address (with that address in the To: or Cc; field) so you can spot it immediately, or have it moved to a special folder. Depending on the type of account you're using to receive the forwarded messages, there may be many other options for how you deal with them. Click the Settings icon in Zoho Mail. Find the Mail Accounts category and click Email Forwarding. Click Email address in the dialog box that opens and type the email address of the account you want your Zoho Mail messages forwarded to. Then press Enter. An Email Forwarding - Verification dialog box opens. Check the email address to which you are forwarding for a confirmation message from Zoho Mail. Copy the confirmation code that's included in the message and then go back to the Email Forwarding - Verification dialog box. Paste the confirmation code in the text box provided and click Verify. You're returned to the Forwarding dialog box. If you'd like to delete the message from the Zoho Mail account once it's forwarded, be sure to select the Delete Original Email Copy... option before you close your settings tab. That's all there is to it. From this point, all messages received at this account will be forwarded to the email address you specified during the process. Follow the Settings link in Zoho Mail. Click Mail to open your Mail settings. Find the Filters category and click Create New Filter. Enter Filter name for the new filter. Under the Conditions section of the filter choose To in the first drop-down menu. Then select Select Contains in the second drop-down menu. Next, type the email address for the account you are forwarding. Then, under the Actions section, select Forward email to in the first drop-down menu. Type the email address you want messages forward to into the text box provided. Decide if you want other filters to process on the messages once this filter is run (in this case, we left Do not process other filters checked). Click Save. You'll be returned to your filter list, and the new filter you just created will be at the top of the list. Once you've completed these steps, any mail that is sent to the email address you want to have forwarded will automatically be pushed forward to the email address where you want to receive it. And that forwarding will continue until you remove that filter. Zoho Mail: It's Free But Is It Worth It? Receive iCloud Email at Another Address? Here's How. Looking for the Zoho Mail SMTP Settings? We Have Them! 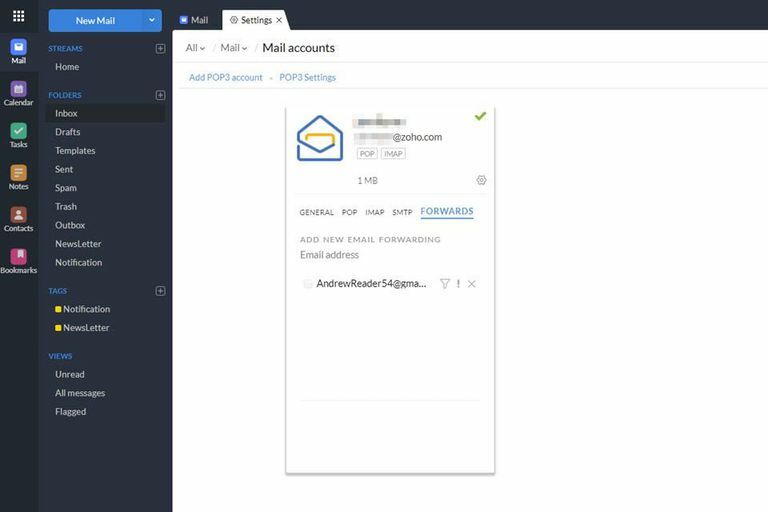 Need POP Settings to Get Zoho Mail in an Email App? Find Them Here. Did You Know You Can Forward Emails in Outlook.com?